During a trip to Egypt in 1985, Swiss archaeologist Gregor Sporri uncovered possible evidence that giants once co-existed with mankind... well, sort of. 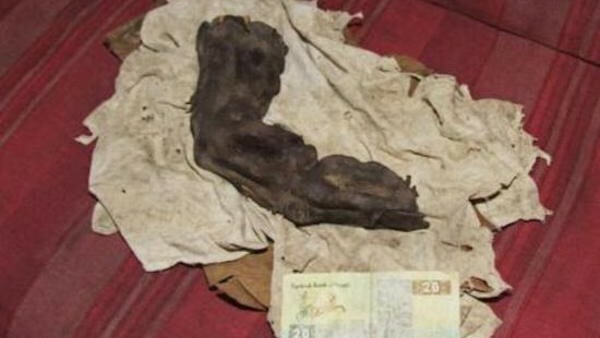 In the land of the pyramids, Sporri met up with a grave robber who presented him with something wholly unexpected: a mummified finger measuring in at 15 inches long. The owner of such a whopping digit would have to be at least 12 feet tall. Some claimed hoax, but the photograph was published by a credible source, leading European newspaper Bild and nobody was able to conclusively debunk it. Archaeologists have never dug up any other remains to support claims that giants once walked among the Egyptians, but this photo drove the tin hat brigade crazy.